I've decided to embrace the aesthetics of plastic. Disposal of our household containers is a hot topic thanks to David Attenborough (and a government of very late adopters!!) and I don't know how much energy is used in recycling to collect, sort, wash, shred, melt? etc but certainly alot. So if we can re-use as much as possible at home and in that way save on the recycling and change our idea of it as "waste" then that must surely be better. These containers aren't ugly are they? 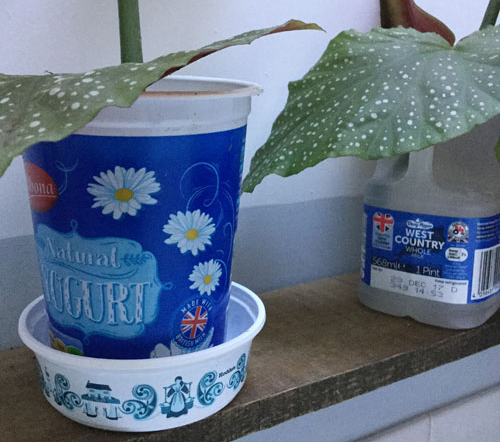 By the way I'm rooting and potting on spotty leaved begonias here. I see alot of great styling and photography online with beautiful objects, and interiors but sometimes I think the styling is too good and wonder where they hide all the "ugly" or off trend or un-photogenic kitchen stuff. I don't see why we cant have our beautiful ceramics and glass alongside reused plastic quite happily. We may need to re-jig our aesthetic ideas though. Fashion re-jigs that for you regularly anyway; it often only takes a few influential people and a wave of images to make our taste evolve. 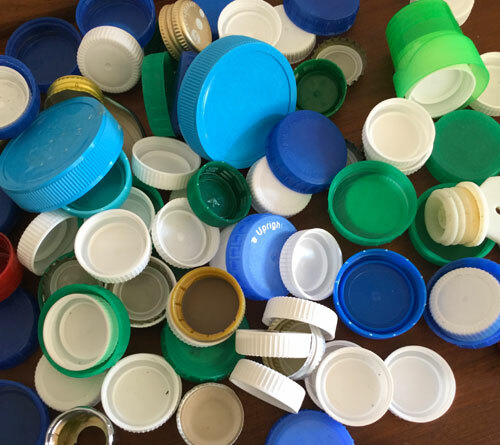 The council used not to collect the lids for recycling so I started keeping them. I always think collections of these sort of objects can go to a (enlightened!) 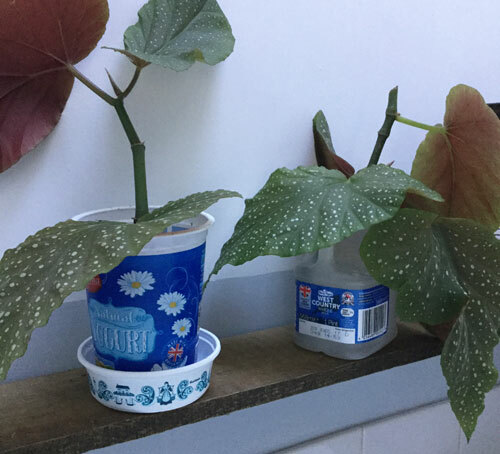 school for kids projects if they haven't found another use. I think alot of us makers hate throwing things away because we appreciate how things are made - the mould, the screw thread etc. My plan for these is to make some Xmas decorations with them next winter and the challenge is that they must not be naff and rubbishy looking! So here's my inspiration below. 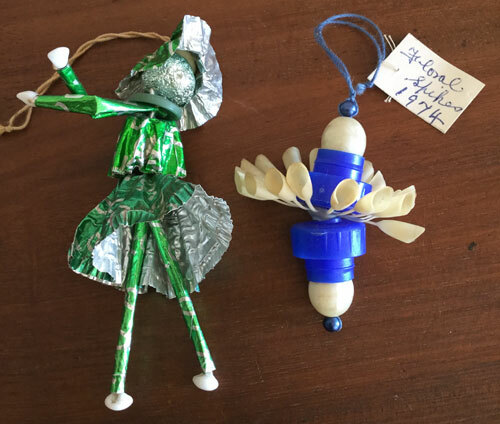 These were given to me by the artist Lucy Casson who had found a collection of them in a charity shop. The blue and white decoration is made from 2 detergent bottle lids, 4 beads and a piece of a plastic flower - genius! So by incorporating the lids with a few other things I think you could make some acceptable Xmas tree decorations. Mine are an eclectic selection that's evolved over many decades and I love the quirkiest ones best so these two fit in perfectly. 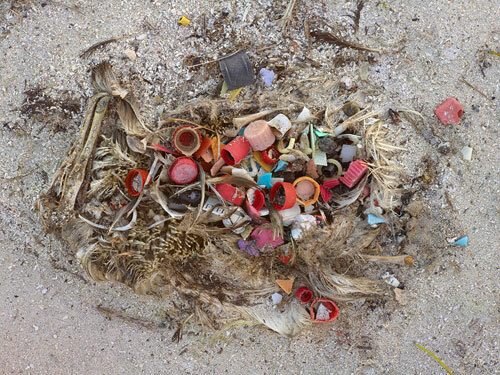 If you need any more convincing about the dangers of plastic take a look at more of this work below by Chris Jordan. When I first saw these photos about 4 years ago I was shocked by the horrific beauty of them - as an abstract collage - but then the reality kicks in of these birds killed by our debris - devastating but important photographs. 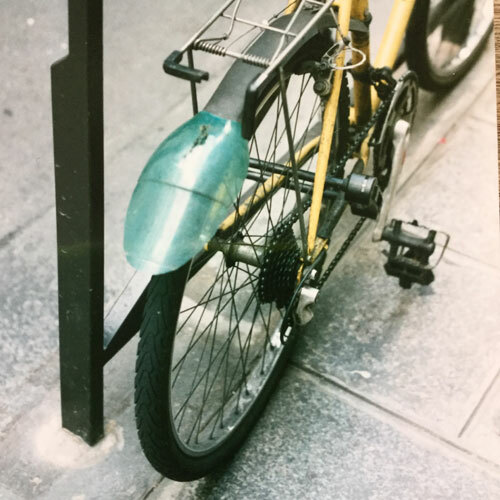 And I spotted this plastic bottle mudguard extension in Paris many years ago. I borrowed the idea for my own bike by making holes in the mudguard and attaching a section of bottle by stitching it on with galvanised wire. I love simple but brilliant ideas like this.